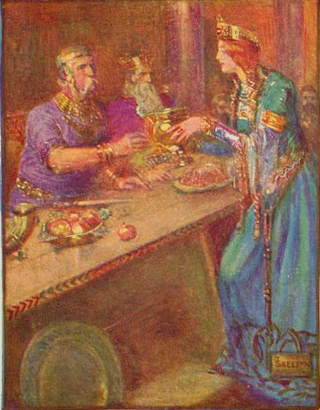 Wealhtheow makes her way to Beowulf, who graciously takes of the mead she offers before addressing her formally. of distinguished mind/heart, bore the mead cup. Where to start? This passage has a lot happening in it. Since choosing just one to write on this week would mean skimming over some curious speculation, let’s just go through the major points. I know I touched on this last week, but what, exactly, is Wealhtheow? Up to this point in the poem she’s been introduced as Hrothgar’s queen and her name makes it abundantly clear that she is likely in that relationship for the sake of political expediency rather than any strong, all-conquering love. Later in this passage she’s also referred to as a queen. So that makes it pretty clear. This word translates to “virgin;” “woman,” “wife,” “lady,” or “queen.” I get that this is probably just here for the alliteration of the line (phonetically the Old English reads: “iumb-eh e-o-deh tha e-dez hel-min-ga”), but even so, using that word simply for alliteration’s sake feels like a stretch. Almost as much a one as my reading into this word. At this point in the poem, the poet puts his focus squarely onto Wealhtheow. As such, it’s possible that a vague word like “ides” is used here to reflect the variety of perceptions the men in the hall have of her. Some see her as mother, others as their lord’s wife or queen, and to others still she was a woman or a lady, possibly even a virgin (at least figuratively, unless the apparent marital strife between them is about more than Hrothgar being able to raise his sword against Grendel). 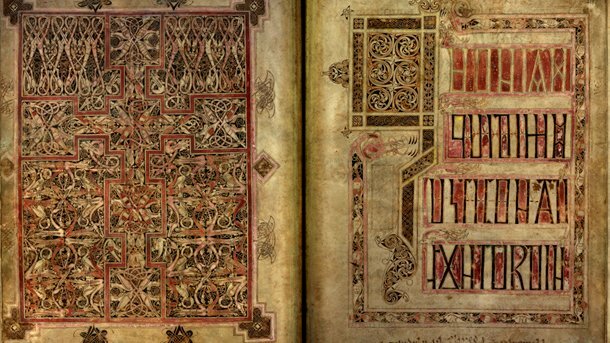 Of course, it’s hard to say how the person who wrote or composed Beowulf worked. Did they ever come up with an alliteration before a line was written out, or even have a sense of which letter would be that’s line’s sound and then build the line out from there? Perhaps with this line in particular the poet/scribe may have simply wanted to use “i” or “ides” (or “eode”) here and then built outward. Whatever the case, figuring out just who Wealhtheow is as a person is made even more difficult by the line below describing her as having a “distinguished heart.” Is she an incredibly early expression of the idea of a noble savage? Did the Anglo-Saxons maybe consider the Celts in the same way that later Europeans considered First Nations? Onto the arrangement of the hall. Line 621 states that Wealhtheow “went about the hall to the experienced and the young alike” (“duguþe ond geogoþe dæl æghwylcne”). What’s unclear about this line is whether those in the hall are all young and experienced (kind of a strange combination) or if the experienced sit together and the young do the same. My guess is that it’s more the former, mostly because it makes sense that these two words represent two distinct groups and because the Geats’ needing to be let into some sort of inner chamber to see Hrothgar suggests that rank (won through experience, and therefore, age) is reflected in where your seat is. I think that these divisions of young and experienced aren’t as you might expect, though. I don’t think “young” denotes someone who has not been alive for very long. Instead, I think that it refers to someone young in the way of battle. Why? Because the word that I’ve translated as “experienced” is also commonly used to describe or denote warriors. As such I think the poet is working in a dichotomy and though young and experienced could be seen as opposites, I think it’s a very specific sort of “young” that the poet has in mind. Besides, Beowulf himself at this point in the story can’t be more than 20. Yet he is, at least according to his own stories, vastly experienced. Again, there are probably some in Hrothgar’s retinue that aren’t grey about the temples but have nonetheless seen plenty of combat. So it looks to me like Heorot’s seating reflects the Danes’ various skill levels. After Wealhtheow has thanked Beowulf (for his boasts, at this point), the poet launches into a description of the warrior before he breaks into a speech. Why is Beowulf characterized by such an adjective as this? I suppose it’s possible that the poet is exulting in Beowulf’s deeds in combat or is trying to give the impression that Beowulf has seen this attractive (“ring adorned” (“beaghroden” (l.623))) lady and is trying to puff himself up to impress her. Even so, using a word that carries “bloodthirsty” among its definitions seems like overkill to me. Unless, the word “wælreow” started off with more positive connotations (maybe as another way to refer to berserkers?) but then slowly deteriorated over time. Though, perhaps this is also part of Beowulf’s puffing up for Wealhtheow, maybe his animalistic nature is expressed sexually as well as in battle? Or maybe her thanking him has revved him up to fight Grendel? What do you think about anything I’ve raised in this section? Leave your thoughts in the comments! Although I mentioned it in the above section, the word that seemed a bit extreme to describe Beowulf’s fierceness, “wælreow” bears further investigation. This word is one of my favourite types of words – a compound. As a such, what are its parts? Bringing the other possible meaning of “hreow” into the picture makes things even more curious since a slaughter that a warlike person regrets or is sorrowful over suggests that they were not themselves in their rage. Perhaps, as I suggested in an earlier entry, Beowulf’s fighting style or battle prowess somehow relates to the practice of going berserk. If so, here, as Beowulf primes himself for his fight with Grendel, we see him starting to get into his battle frenzy. And no doubt, Beowulf would fight in a battle frenzy. One example doesn’t make a strong case, but one of the central players in Celtic myth, Cuchulain entered into a battle frenzy in which his entire body convulsed and became grotesquely changed. Maybe Beowulf does the same or is feared for being capable of doing the same? That “wis” and “fæst” combine to simply make “wise” is incredibly straightforward. Though, I think the modern English word “wise” loses some of the original’s oomf. After all, it’s not just the word wise, there’s a sense that the wisdom that the compound describes is something tried and true, a sort of wisdom not born merely of experience, but also from those who have gone before. Although there’s no mention of learning or reading, I get the sense that it could be the sort of wisdom that comes from instruction and experience. Or, if “reputable and standard” work as defintions of “fæst,” wisfæst” could be a sort of common sense – suggesting that even in the early medieval period those who had such sense weren’t so common and were this considered wise. Though maybe it’s because Wealhtheow doesn’t seem to get high off of her own supply that she and her common sense seem indeed marvellous. Though, again, what exactly is her position and character? Lastly, I just want to bring up the word “gieddan” (l.630). It’s not a compound word, but it is one that hasn’t shown up in the poem before. It’s another word for “said,” basically, though its dictionary entry offers “speak formally, discuss, speak with alliteration, recite, sing.” The implication of this word’s use being that what Beowulf is about to speak formally (maybe even musically?). The word fits perfectly with line 630’s alliterating “g” sounds, but I still like to think that the poet expresses the idea that Beowulf is about to speak (before, weirdly, using the formulaic “Beowulf spoke, son of Ecgtheow” in next week’s first line) by saying he’s about to speak formally to round off the image of this young (possibly still teenaged) Beowulf seeing the lovely Wealhtheow and puffing himself up to attract her attention. What do you think is up with Wealhtheow? Is she just Hrothgar’s queen and nothing more? Or is she somehow working behind the scenes, keeping the Danes going? Next week, Beowulf sings to Wealhtheow an assurance of his boast about beating Grendel and she goes to sit with Hrothgar, fully contented — for the moment.